On August 4, 2015, I published the following post on Book Riot. If you ask me, the William Shakespeare character that stands out the most is Shylock, the Jewish moneylender in The Merchant of Venice. The character of Shylock is controversial in many ways and has been debated frequently over the years. Is Shylock an anti-Semitic portrayal of a Jew? If so, does that mean that we have to stop reading and producing the play? In my view, Shylock is a thoroughly problematic character. 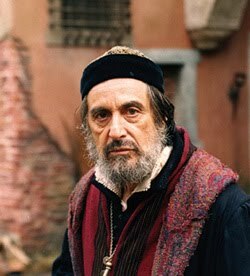 But my interest in Shylock is not so much whether or not the portrayal of him is anti-Semitic. To me that is a moot point. Hatred and prejudice against Jews was prevalent during Shakespeare’s lifetime, and Shakespeare himself was by no means unaffected by this. What interests me about Shylock is the fact the character exists at all. This entry was posted in History, Writing & Reading and tagged Al Pacino, anti-Semitism, Edict of Expulsion, Jews, pound of flesh, Shylock, The Merchant of Venice, William Shakespeare by Erika Harlitz-Kern. Bookmark the permalink.